These days almost everyone has a Mobile phone with a Gprs connection and the necessity to share files and photos on the go has become very crucial in this hectic world. So if you are having a Gprs connection and want to transfer files like Audio, Video, Photos or any application files it can be done with in a simple 5 step Procedure. Steps to Transfer Files from one mobile phone to another mobile anywhere in the world. One should have a Gprs enabled Mobile Phone to transfer files. 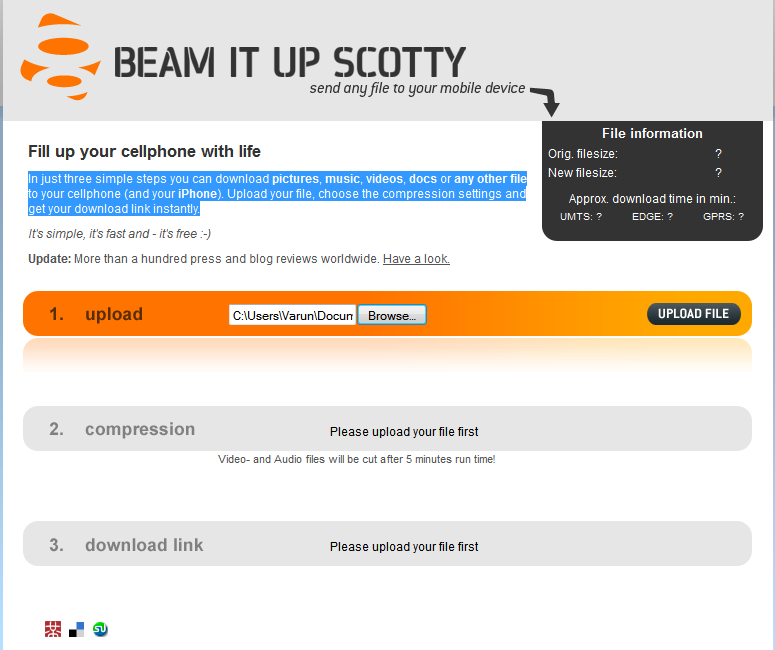 Step 1: Click on the Browse Tab and then select the file, photo, video or Docs which you want to send and press Upload. Your file will then be uploaded onto the servers. 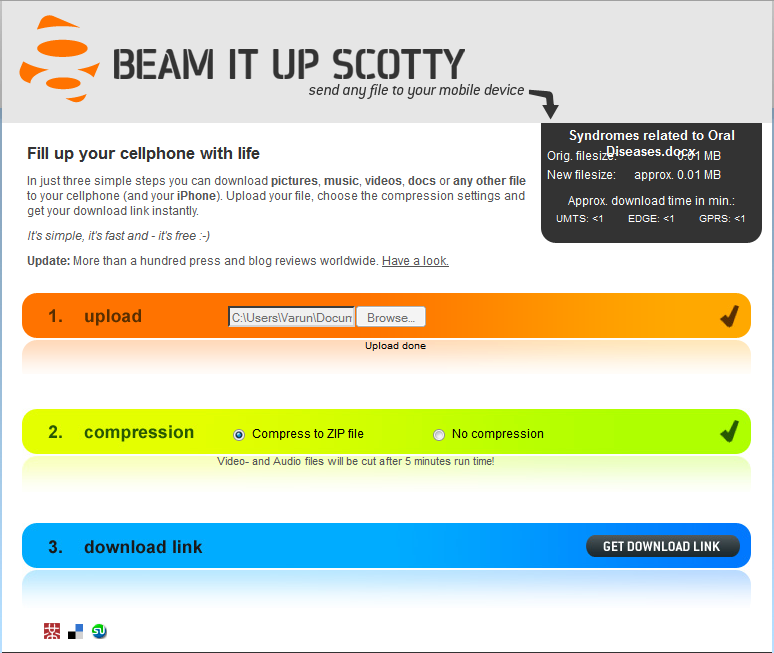 Once you have uploaded the File onto the Beam it up Scotty Server on the Right side top of the screen you will be seeing a Black Box which will be giving you the information about the file which you have uploaded like the Size of the file and estimated time to download on your mobile phone. Step 2: In this you be given options weather to Keep your file in the normal uploaded size or weather you would wish to Compress or Zip the file. 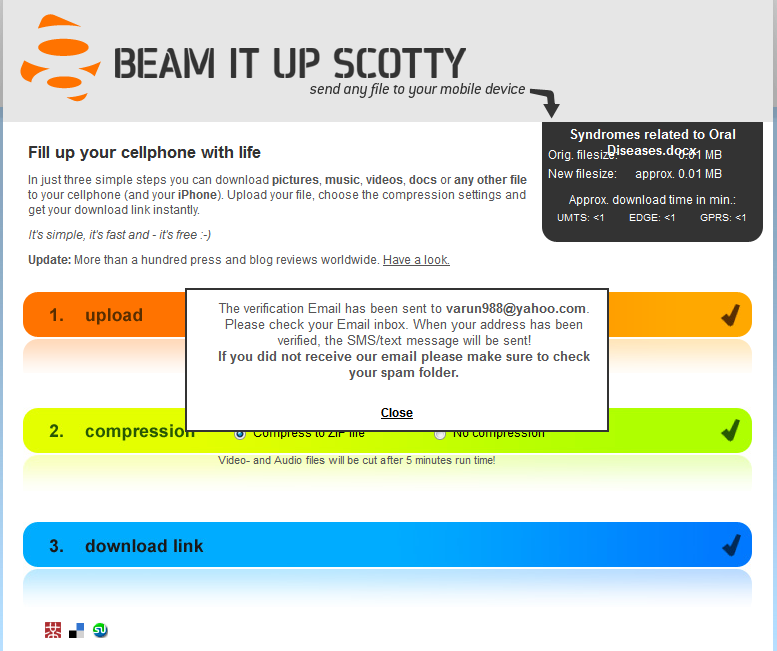 Step 3: Once you have selected the Option there will be a box opening which will be asking you Enter your Email address so that Beam it up Scotty can send you the link personally to your Email address which can be later shared with your friends and family via SMS so that they can view the following files or photos or videos personally. How to send the Link directly to Mobile phone as an SMS. Step 3: Now insted of entering your Email Address where the link will be sent to you have to give the Phone number where the file is destined to be sent. This can be seen in the image below. After you have entered the Phone Number with the Country code if you are sending to another country or add “0” in front of the number if it is within the same Country. After this process your link will be sent to the respective number as a SMS. This is a totally free of cost process with which you can send your files, photos, videos and many more to your mobile phones directly without any cost. The main advantage of this Application is that it allows us to send files, photos, videos, songs etc to iPhone which does not have Bluetooth support and this application makes it a boon for iPhone users.